A SEVEN-year-old boy who has spent most of his Christmases in hospital has been given a surprise trip to Disneyland Paris by a Torquay gym and Torquay charity. Ryan Edwards, who is undergoing treatment for neuroblastoma, a rare cancer that affects children, is going to France on Friday for a four-day holiday with his parents Julie and Gareth. 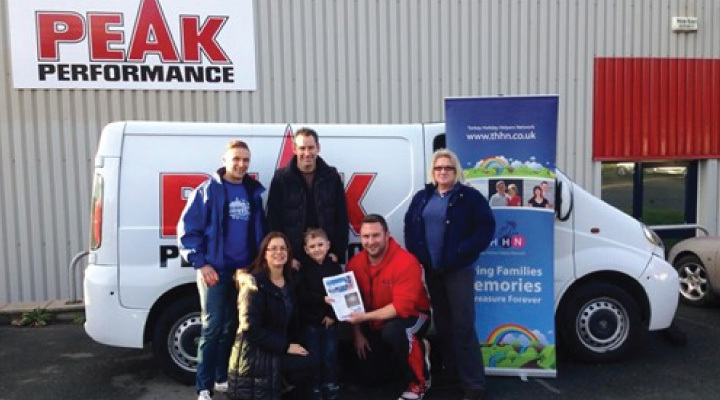 The family visited Peak Performance in Torquay on Monday so Ryan could be told about the plan and presented with the tickets. The gym ran a 12-week weight-loss challenge, and the prize was a trip to Los Angeles to train at Gold’s Gym. The winner was Beccy Shields, a 52-year-old community psychiatric nurse from Barton, Torquay, who lost 51lb. As she recently had surgery, she could not accept the prize, and gym owner Miles Leeson suggested they offered a family holiday through the Torbay Holiday Helpers Network instead. THHN founder and chairman Luke Tillen said: “We allocated the trip to the Edwards family who were referred to us by the Exeter CLIC Sargent team. Miles said: “I felt like it devalued the prize passing it onto whoever came second or third until we found someone who could go. “Instead, we put together a holiday package and donated it to Luke’s amazing charity which provides experiences for families who have children with life-limiting or threatening illnesses or conditions. Julie said Ryan has been poorly since he was 22 months old. He has undergone treatment in Bristol and London, including 12 types of chemotherapy, radiotherapy, and ‘hundreds’ of blood transfusions. He had a bone marrow transplant in Germany last year, when Julie gave him some of her stem cells. He had to stay in the country for nine months. Julie said: “Ryan is amazing. He has coped really well. We’ve talked about doing something wonderful for him but we’ve never had the opportunity.